I admit, I’m a HUGE fan of Elizabeth Eulberg. Not only does she write hilarious and delightful YA, she’s a cheese-loving, Green-and-Gold-in-her-veins, Friday Night Fish Fry fan. She may live in NYC, but she’ll always be a Wisconsinite at heart. I’ve read all her books and can’t wait to get my paws on her latest, WE CAN WORK IT OUT, a sequel to her girl-power, Beatles-infused debut THE LONELY HEARTS CLUB. Not only can I buy my copy on Tuesday, January 27, but I’ll even get to see her at her launch party. If you’re in the neighborhood, come join me. When Penny Lane started The Lonely Hearts Club, the goal was simple: to show that girls didn’t need to define themselves by how guys looked at them, and didn’t have to value boyfriends over everything else. Penny thought she’d be an outcast for life . . . but then the club became far more popular than she ever imagined it would be. But what happens when the girl who never thought she’d date a good guy suddenly finds herself dating a great one? She doesn’t need a boyfriend . . . but she wants it to work out with this particular boyfriend. And he wants it to work out with her. Penny Lane worked hard to declare her independence. Now she needs to figure out what to do with it — and how to balance what she wants with what everyone else wants. Now that you know a little about the story, Elizabeth is here to tell you what it was like returning to her debut. An author never re-reads her book after its published. This was one of the many fun facts I learned about authors back when I was a book publicist. I never really understood why an author wouldn’t want to revisit a book. Don’t they miss the characters? Wouldn’t they want to read it for fun? Then I became an author. Writers are their own worst critics. When I would flip through one of my books to find something to read for an event, I’d cringe at some of my word choices. Could I have made that line funnier? How many times can I overuse that phrase? I finally got it. I vowed to never read any of my books after its published. Then I decided to write a sequel to my first book. For five years, I’d wanted to revisit my characters from The Lonely Hearts Club. I danced with joy when my publisher Scholastic greenlit the sequel, We Can Work it Out. I knew exactly what I wanted to do. But first, I had to re-read The Lonely Hearts Club. I not only wanted to get the main character Penny Lane Bloom’s voice back in my head, but I needed to remember everything that had happened. It wasn’t like I’d forgotten, but it had been a few years. Plus, I wrote more drafts of The Lonely Hearts Club than any other book (seventeen). Even at events, I’d mention something that I thought was in the book, but then a reader would look blankly at me until I realized it was edited out. I couldn’t put it off any longer. I sat down with a nervous feeling in my stomach and opened up The Lonely Hearts Club. Since it was my first, I knew (or at least had hoped) that I had grown as a writer over the last five years and four books. How bad was it going to be? Would I be horrified that this book is on a shelf? That people are—gasp!—reading it? I took a deep breath as I began reading the opening and didn’t get up until the last page. You know what? It wasn’t that traumatizing. Sure, there were a few little things that I would’ve changed in terms of writing, but there were times that I actually laughed out loud at something that I wrote. A couple instances when I was impressed by a description (since even now I’m not great at describing people/places/things). So would I really change anything about my first book? Thank you, Elizabeth, for stopping by! GIVEAWAY: Comment on this post by Noon (EST) on Friday, January 30 to enter to win a copy of WE CAN WORK IT OUT (U.S. only). Follow The Debutante Ball on Facebook and Twitter for extra entries—just mention that you did so in your comments. We’ll choose and contact the winner on Friday. Good luck! 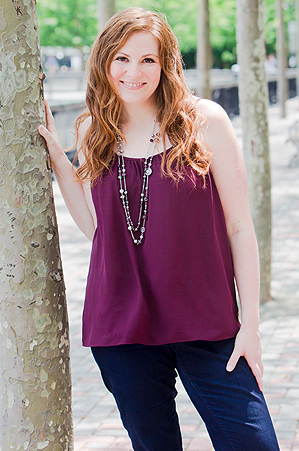 Elizabeth Eulberg was born and raised in Wisconsin before heading off to college at Syracuse University and making a career in the New York City book biz. Now a full-time writer, she is the author of THE LONELY HEARTS CLUB, PROM & PREJUDICE, TAKE A BOW, REVENGE OF THE GIRL WITH THE GREAT PERSONALITY, BETTER OFF FRIENDS, and WE CAN WORK IT OUT. She lives outside of Manhattan with her three guitars, two keyboards, and one drumstick.Visit her at www.elizabetheulberg.com. Follow Elizabeth on Twitter. I loved The Lonely Hearts Club so I’m thrilled to see there’s a sequel! I absolutely loved the lonely hearts club and can’t wait to revisit the characters! 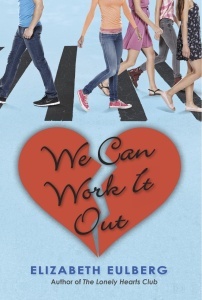 I loved The Lonely Hearts Club and look forward to reading We Can Work It Out.